@Peter: thanks for additional info. i f the network is started and you click 'OK' then the changes (also if there were no) are written to the system back and then you got no more IP-address. Edit: phox, this seems to be 50% problem with QEMU cause I get the same with BartPE or WinPE. 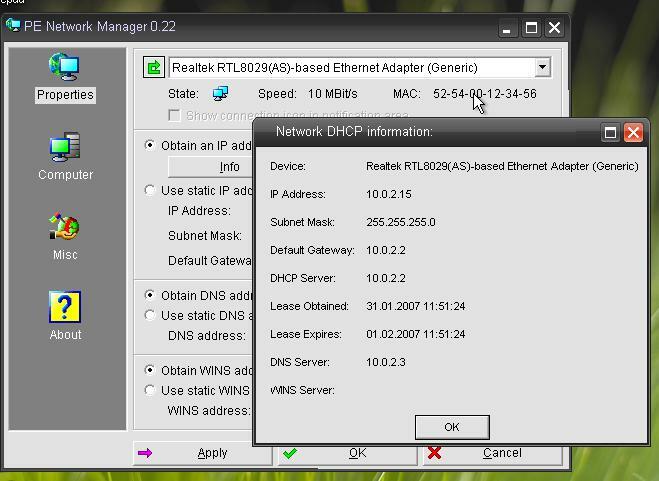 This first time I get an ipaddress but after releasing and renewing there is no contact anymore to the DHCP-server. So I will correct just my bug, if there are no changes on the settings - there will be not written changes to the system. For now after network initialization you have to click "Cancel" in the GUI. Edit2: seems to work now, still small problem with computer renaming. I have a experience with netshell.dll not found and TCP/IP error. I tested with WB063 version today. But I tested with penetcfg.exe + bartpe.exe ,,,,,,, TCP/IP error is appeared, so I think it is not a bug in your script. netshell.dll is needed for network and you can add in your script. Thanks for your time and hard work. "netshell" is not needed for me but if you want to use "ipconfig". @all: can someone send me an unicode ini/inf-file - I want to do some checks again. So I need a file with special characters in it. I'm just working on some adds/changes again (cmdline parameter for gui-showing, starting, etc., simple network drive adding). Do you think a send it to tray function would be possible? This way it would feel a little bit more like home. If I decide to start the pnp detection and net during boot time, then the message box asking for that should not appear. Are you sure to have the "Qemu Network Driver" activated? Nice work Holger - keeps getting better and better! To replace "Do you wanna start it now?" with "Start network services?" And replace "protocoll" with "protocol"
I also get the same output as TheHive under LiveXP - no network card is detected altought the script is enabled.. When the main window comes up, is it possible to already have selected the "Obtain an IP adress automatically"
Some look really good, hope you like them. @Peter: there will a cmdline parameter (silent, nogui or something like that). -> Autostarting for now means, automatically starts "PENetwork"
@Hive: no idea - like Peter maybe said-missing network driver, will make some tests without any network cards. Normally there should be a message that there no network cards could be detected. @Nuno: No thisone you could later change by your own language file. Maybe I will optional put some parameters into the settings-ini to use maybe icons of another exe or icl-file. When in my LiveXP project I activate all drivers and all apps, then I have the same result. My opinion: Holger's program seems to work correctly, but any of the all's does something strange in the PE. Im glad im not the only one not getting network connection with the latest LiveXp. Hope this gets sorted. And as far as I can tell im using the defaults from the LiveXP project. 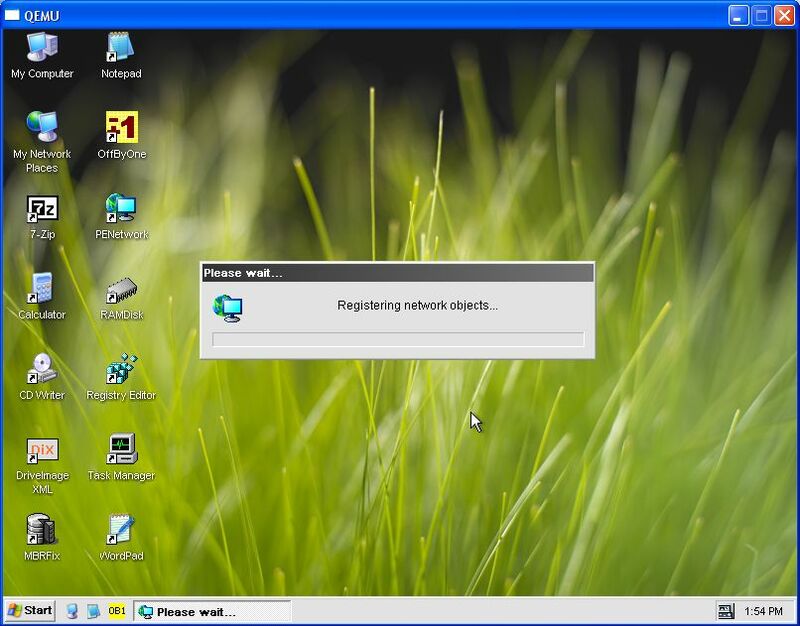 It includes all the scripts active for adding network cards for VMwarer, VirtualPC and Qemu. But none seem to be seen in the LiveXP Project. Thanks for taking a look into this. It has something todo with the "Go2PDF Virtual PDF Printer"-script. - "startnet" returns 0x2 -> ERROR_FILE_NOT_FOUND. From WDDK: "...The path specified for FullInfPath does not exist." A caller-supplied full path to an INF file and any associated driver files. The files should be on the distribution media or in a vendor-created directory, not in a system location such as %windir%\inf. The function copies driver files to the appropriate system locations if the installation is successful." Thanks Holger, this worked - who'd figure? I've tried the default values, but how should I use to get it working under qemu? @Nuno: what do you mean with "...I've tried the default values, but how should I use to get it working under qemu?" Do you mean how to use then the "Go2PDF"-printer? In this, the value for "SystemSetupInProgress" is set to "0x0" which causes the problem/kills my hardware detection. Maybe someone can me explain why this value is set to 0x0? Fast solution: will change now the SystemSetupInProgress-value to 0x1 for installing devices and then change it back to it's original value. Seems, that printing is not allowed in "setup-running-mode"
Holger: Thanks for the text modifications - only one thing left (if I'm not pushing my luck here..): the question message box should probably be "Start network support?" instead "Starting network support?" - not that it bothers me personally but I know your efforts and wouldn't like to see people descredit it using unfair "ad hominem" arguments. TheHive, Holger: I've disabled the go2pdf script and the NIC is recognized as supposed, used automatic settings on PE network config but was still unable to connect onto the internet after this. Off by One gives no sign of google either.. I'm using Qemu and am quite sure that my network is working correctly on the host machine, Is there any other step needed for this? Any ip adress to ping for testing? ping on 10.0.2.2 and 10.0.2.3 gives "Destination specified is invalid" and only replies sucessfuly from myself at 10.0.2.15 - this was done testing the internal ping function. Using ping from command line after pressing ok and leaving PE network config application, both 10.0.2.2 and 10.0.2.15 ping just fine, only 10.0.2.3 fails.. Sorry for all these questions, never really had needed to set up network support under qemu before.. I used the go2pdf when using the new v4 of PENetwork Manger. It was fine. Same good result on my system with XP SP2. Will take a look later. W2003 only fails if again all apps and all drivers are installed. If I use only notepad, taskmanager, ob1 and regedit apps and qemu net driver, it works perfect under w2003 'normal' and RAM boot.